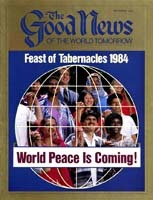 For God's people around the world, the Feast of Tabernacles is the happiest time of the entire year! In large part that's because God ordained the Feast to be family oriented. It is a special, week-long opportunity for the entire family to be together in celebration of the coming wonderful world tomorrow. Both parents and youths of God's Church look forward to the Feast with great anticipation all year long. For the children, the Feast is full of activities and new things to see. For the adults, it's a wonderful change of pace and an opportunity to be spiritually rejuvenated and rededicated, and to rejoice with our spiritual Family — our brothers and sisters in Jesus Christ, with whom we are going to spend eternity. Let's review several basic scriptures about the Feast to see why God emphasizes family unity and rejoicing together at this annual commanded assembly. 1. What is the divinely set theme for the Feast of Tabernacles? Deuteronomy 16:13-15. (Notice 'the words surely rejoice in verse 15. The Revised Standard Version renders this "be altogether joyful.") Does God intend for everyone — regardless of age, social strata or economic level — to rejoice during the Feast? Verse 14. God tells us that the Feast of Tabernacles is to be a happy, wonderful time. For the congregation of ancient Israel — God's physical, Old Testament Church in the wilderness (Acts 7:38) — it was a time of rejoicing because the abundant winter's store of food was harvested just before the Feast. But the Feast has far greater significance for God's spiritual Church today. The Feast of Tabernacles pictures — is a foretaste of — the prosperity, happiness, joy and universal peace that will come about in the Millennium under the righteous rule of Jesus Christ. Obedience to God's laws and revealed way of life will make the world tomorrow a supremely happy place. 2. Does God intend for the husband to take his wife and children with him to rejoice together at the Feast? Deuteronomy 12:5, 7, 12, 16:14. Are they to live in temporary dwellings at the place designated by God for the observance of this Feast? Leviticus 23:42. 3. Did Jesus Christ, as a young child, keep God's (not man's — Leviticus 23:1-2) annual festivals with His human family? Luke 2:41-42. Did He continue to keep these days as an adult? John 7:1-2, 10-11, 14. Jesus Christ observed all of God's annual festivals from early childhood. Joseph, His human guardian, and Mary, His mother, obediently kept all the annual festivals together with Jesus and Jesus' younger brothers and sisters. Jesus rejoiced with His human family at the Feast of Tabernacles, just as He, the Lord God of the Old Testament, had commanded ancient Israel to rejoice. 4. But will it sometimes be impossible to take all of our family members to the Feast of Tabernacles with us? Matthew 10:36. Of course it is not always possible for all of God's people to be with their physical families at the Feast, especially if some family members have not yet been called by God and therefore do not want to observe God's festivals. But God expects His people to attend this week-long feast with their immediate families, if at all possible, so they may rejoice together. 5. Are only families to rejoice at the Feast of Tabernacles? What about those who, for one reason or another, are alone at the Feast? Deuteronomy 16:14. The Feast is not a time to go off away from others and have a private vacation. God commands all of His people to come together to be taught, to fellowship and to rejoice, whether or not they are married and have children. Even if we don't have physical relatives with us, we can still experience the joy and abundance of this festival with other members of God's Church. For those with physical families, the Feast of Tabernacles is a wonderful time to show Christian love by fellowshipping with the widows, orphans and others who are alone at the Feast. The Feast of Tabernacles is a time of real fun for young and old alike. It is an occasion for families to be together for more than a week, in addition to travel time to and from the Feast. It IS a time of concentrated teaching by God's ministers. The Feast is also a time for fellowship with brethren from different parts of the country and even other nations. Christians at the Feast demonstrate now, by the way they live together in harmony, what this entire world could be like if everyone followed God's laws — and what the world will be like after Jesus Christ returns! Clearly, keeping the Feast is a great opportunity our heavenly Father gives us, in which many of us can strengthen relationships with our physical families and where we can all develop family ties with many of our spiritual brethren. Not only does the Feast picture the Millennium, it is also a foretaste of being in the universe-ruling Kingdom of God — of sharing eternity together as glorified members of the Family of God. 6. Does God plainly show that it is His purpose to increase His divine Family by bringing many spiritual children into it? II Corinthians 6:18, Hebrews 2:9-10, Revelation 21:7. 7. Is Jesus Christ actually the firstborn of many children of God? Romans 8:29, Colossians 1:18. Jesus Christ is God's firstborn Son and our Elder Brother because we, too, if we are true Christians, can be born into the Family of God at the resurrection. Notice further. 8. Are Christians already called the children of God the Father? I John 3:1-2. But even though considered God's children, are they now only "heirs" — ones who shall, in the future, become inheritors? Galatians 4:6-7, Romans 8:14-17. Why are they only heirs today? I Peter 1:3-4. Those who have been called by God (John 6:44) to be a part of His spiritual Family are now only begotten children — begotten by God's Spirit, but not yet born of God's Spirit (John 3:1-8). It is when they are born of God at the resurrection that they become inheritors of God's Kingdom — divine, eternal members of the Family of God. 9. How does one become "begotten" of God? Acts 2:38. Does the receipt of God's Holy Spirit then make him or her a true Christian? Romans 8:9-10. When God gives you the precious gift of His Holy Spirit, you become a begotten son or daughter of God — His very own child, actually begotten of Him by His Spirit entering your mind, joining with the " spirit of the man" (I Corinthians 2:9-12). God then becomes your heavenly Father (Matthew 6:9). Not figuratively, just because He created all mankind, but in reality. Just as a human father gives his physical characteristics to his children when they are begotten, God gives His spiritual characteristics to His Spirit-begotten children (II Peter 1:4). And just as a human father's children are humans, God's begotten children will one day be Gods! When begotten by God's Holy Spirit, we enter a family relationship with our Father in heaven and our Elder Brother, Jesus Christ (Matthew 28:19, Hebrews 2:11-12). But just as an unborn physical child must grow large enough to be born of its human mother, so the begotten Christian must grow spiritually — in the grace and knowledge of Jesus Christ and in the fruits of God's Spirit (II Peter 3:18, Galatians 5:22-23). With God's help, he is to overcome sin and develop spiritual character before he can be born into the heavenly Father's spiritual Family at Jesus Christ's return. 10. While we are in the spiritually begotten state, who does the Bible show is our spiritual mother? Galatians 4:26. How does she feed, nurture, guide and protect the Spirit-begotten children of God the Father? Ephesians 4:11-13, I Peter 5:1-3. God's Church is the "mother of us all." As a human mother carries her unborn child where it is protected and nourished, God's Church, through God's called and chosen ministry, instructs, teaches, counsels, advises and protects from spiritual harm its members before their spiritual birth. At the Feast of Tabernacles, as well as at God's other annual festivals and weekly Sabbaths, begotten children of God meet together to receive spiritual nourishment from their spiritual mother. Soon God's children will gather at dozens of Feast sites around the world to be fed spiritual food. And an essential part of that spiritual nourishment comes from concentrated Christian fellowship with our physical families and our one great spiritual Family. So let's all rejoice at the Feast of Tabernacles — especially with God our Father, Christ our Elder Brother and with our Spirit-begotten brothers and sisters, many of whom we will have the pleasure of meeting for the first time!